Alright, it's mid afternoon and you've got one last chance to bring something home to your sweetie. Sure flowers are the old standby for the ladies, but what about the guys? or maybe you are looking for something to share after a romantic dinner. Well, how about this? 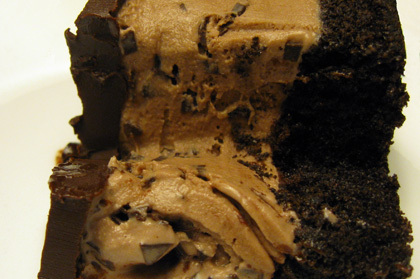 This is a "petite" size Chocolate Chipper ice cream cake that my wife just brought home from Cold Stone Creamery. Sure, usually they are 4" round cakes, but this weekend it was all about the hearts. 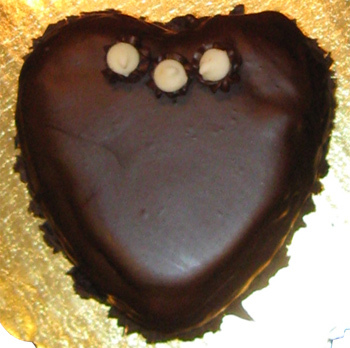 In fact, I think some of the larger cakes might also be heart shaped as well! Here's the side view so you can get a view of the chocolate shavings. I'm not sure if the three white chocolate chips on top have any signifigance. The whole description of our treat is "layers of moist devil's food cake, sweet ice cream, & chocolate shavings wrapped in a rich fudge ganache"
Time to slice this treat open! Now the large cakes would actually have multiple layers inside but since this is really just meant for two, they keep it simple. Ok, the colors are a little off since I had the flash off for a close up, but check out the exquisite nature of this cake! Look how wonderfully thick and fudgy that outer shell is! 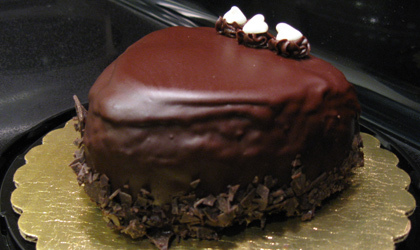 Check out the moist cake! And to hit it out of the park, they've mixed chocolate chips into the chocolate ice cream! Oh man I can't wait to dig in! Guess what? It's positively excellent! They say you need to let it warm up for ten minutes, but between the car ride home, about 30 minutes in the freezer, and then several minutes for me to take pictures and cut it up, well, it was totally melting in my fork (yes, i used a fork since I wasn't sure how hard the shell would be). The shell is excellent, the cake is superb, and the ice cream is wonderful. I even dig the shavings on the outside. I did get a little bit of that coconut vibe that I detect now and then in treat, you know, the vibe that isn't really coconut, but I don't know what else to call it. Well, I don't care about that ting because this was excellent and I had to force myself not to finish it off. I gave a small piece to our daughter, then split the rest in half between me and my wife, except that I only ate half of my piece. I should have splurged but that just means an extra bite tonight. So, if you need to get the ice cream lover in your life a present, or if you just need to put the finishing touch on tonight's meal, try to pick one of these up on the way home. Half a heart looks like a big slice but if it's already started to melt like ours it goes down very easily. Awesome job Cold Stone! On Second Scoop: I just second scoop this one and it was a chocolate lover's paradise. I didn't wait for it to melt this time and instead just enjoyed the frozen ice cream, the rich fudge shell, and the cake underneath. It really does come together perfectly because they've treated it like a high end cake and not just some ice cream treat. Awesome job!